Advanced FPGA projects require advanced tools. Here we present some of our tools that enhance design productivity. One of the missing features of the FPGA tools currently available in the market is the ability to generate register files semi-automatically. Any System-On-Chip (SoC) requires many registers to be connected to the processor. Handcrafting a register file and its related software declaration is a time consuming and error-prone process. The solution for this Hardware/Software interface problem is solved with our Register Builder tool. Register files can now be created easily from one source. The GUI makes it easy to define the registers and bits. All types of output (such as VHDL for the hardware guys, C header for the software team and PDF documentation for both teams) is then generated from a single source. Bugs in the process of creating HW/SW interfaces are eliminated while the documentation is always up to date. Many different HDL design entry tools are on the market that offer some kind of schematic entry and have the ability to generate HDL output. This provides a good overview of the design, but also takes a lot of time to create and maintain. 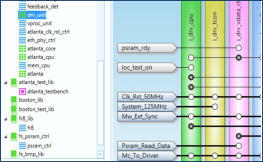 FPGA Solutions has developed a script based HDL linker tool that reads a single file and generates the structural netlists and design files. In a project, signals and interfaces can be declared and used throughout the design. Adding, removing or modifying signals and modules in the hierarchy is quick, easy and does not result in compile errors. 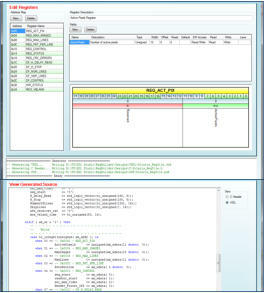 Furthermore, it also writes out files for ModelSim and Altera/Xilinx FPGA tools. A graphical user interface is under development.